Pure Spain bring you authentic Spanish products from the many regions of Spain. Offering you a range of Spanish foods and popular goods that you won't be able to get as easily anywhere else in the UK. Sign up to their newsletter today to explore their range of gourmet food & wine, cookware and perfumery! Discover everything from delicious Spanish charcuterie, famous Spanish wines and tantalising spices to paella ingredients, stunning olive wood and so much more. Bring Spain to your home with ease when you sign up to their newsletter today! Explore kitchenware that'll help you create the best Spanish dishes, unique Spanish hampers and amazingly scented bathroom products. 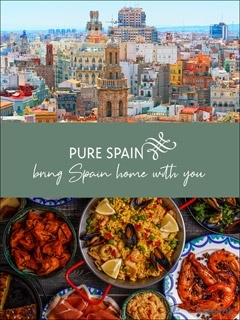 Bring Spain home with you this year and shop with Pure Spain. Sign up to the Pure Spain newsletter today to receive exclusive member only discounts and updates from the Spanish food experts! Officiallondontheatre.co.uk is Londons official theatre website and the place to go for all the latest theatre news, whats on and exclusive ticket offers. So whether you want to know about the hottest new shows opening or hear about the latest London theatre news, officiallondontheatre.co.uk is just the ticket. In the pages of the Danbury Mint Heirlooms &amp; Treasures Catalogue, youll find an exclusive array of fabulous gifts. From inspired collectables such as Limited Edition Steiff Teddy Bears to stunning jewellery, football memorabilia and home accessories, theres so much to choose from! By Pressing the Request Newsletter button you give Pure Spain - Spanish Cuisine & Products (and their Data Processors for the specific purpose of delivering your emails) consent to send you their newsletter via email until such time as you choose to unsubscribe.